OTTAWA -- The country's top military commander was dragged Friday into the long-standing political debate of what constitutes combat in Iraq, even as the Trudeau government comes to grips with the imploding situation in Libya, where U.S.
warplanes have struck extremist training camps. The bombings are seen, potentially, as the opening round in a new front against the Islamic State of Iraq and the Levant, which has for months been building up its presence in the civil war-torn North African nation. A year ago, Gen. Jonathan Vance's predecessor struggled to explain to a House of Commons committee how firefights involving special forces troops and guiding airstrikes for Kurdish forces was not considered combat. It was Vance's turn on Friday, as he rejected categorically the suggestion that his definition of combat was made to measure for the Trudeau government's political needs. "I reject that totally," Vance said. "I am the expert in what is and what is not combat." And what the Liberal government is planning to do to help beat back ISIL is not it, Vance stated. The well-worn debate unfolded Friday against the backdrop of early-morning airstrikes in Sabratha, between Tripoli and Libya's border with Tunisia, an attack that allegedly killed about 40 Islamic State recruits. The defence chief said the Trudeau government has not given him any direction about how Canada might be involved in the new campaign. "I don't know whether we will be involved militarily, but we will certainly be involved somehow, because Libya sits at a crossroads of some very important and dangerous things that are happening in the world," Vance said. Outside the House of Commons, Defence Minister Harjit Sajjan repeated Friday that it's too soon to say how, or even if, Canada would become involved. "As I stated earlier, I've already been in discussions with my NATO allies on this," Sajjan said. "And if -- when -- we have further discussions and if there's a need and where Canada can bring in a certain capability that can assist part of the coalition, we will consider it at that time." On Friday, the focus for Vance was to explain the current mission, rather than any future ones. So-called "advise-and-assist" missions are new enough that some have trouble with the concept, Vance said -- a veiled reference to the NDP, which insists on characterizing the rescoped special forces mission in northern Iraq as a combat mission. 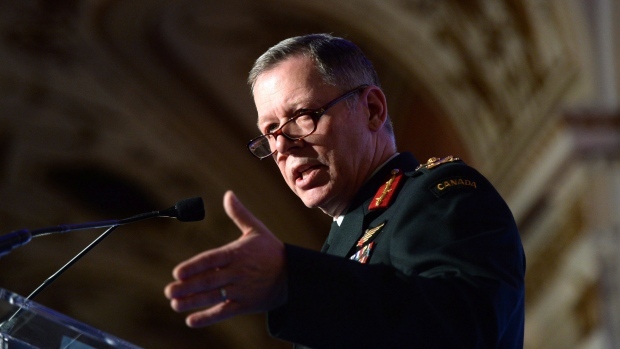 International operations fall under a "broad lexicon -- and some people may be uncomfortable with the lexicon, and that's too bad," Vance told the annual Conference of Defence Associations Institute meeting in Ottawa. "We are using a technique that is relatively new, borne of the lessons of Afghanistan. A 'train, advise and assist' mission clearly falls into the non-combat realm, whereas a combat mission is largely distinguished by the fact we are the principal combatant." Canada's participation in airstrikes against ISIL targets, a mission launched by the previous Conservative government in 2014 and ended by the Liberals earlier this week, was indeed a combat mission, he added. The question of whether Canada has been involved in a combat mission has been an open one, prompting heated debate after it was revealed that Canadian special forces trainers sometimes engaged in firefights with ISIL extremists and helped Kurdish forces by guiding in airstrikes. That debate only got hotter last March when special forces soldier Sgt. Andrew Doiron was killed in a friendly-fire incident last March. Vance's predecessor, retired general Tom Lawson, endured a House of Commons committee grilling that featured Marc Garneau, the Liberal foreign affairs critic at the time, putting the military's own textbook definition of combat before him. "It says, 'A combat operation is a military operation where the use -- or threatened use -- of force, including lethal force, is essential to impose will upon an armed opponent, or to accomplish a mission,"' Garneau said during the January 2015 hearing. "Is this not what we're doing in Iraq?" Like Vance, Lawson denied that the mission met that definition and that troops themselves were not using their "weapons to compel the enemy," but rather only in self-defence whenever they were fired upon. The fact the political debate has not moved forward appears to be a growing source of frustration within the defence establishment. Vance pointed to the peacekeeping and peace support operations of the 1990s -- mostly in the Balkans -- where troops were engaged in firefights, but the missions were never described as combat operations. "If we are attacked, we defend ourselves. So fighting can erupt and in that context we don't fall into the trap of describing it as anything else other than a peace support operation," he said. Vance said he believes advise-and-assist missions are likely the future for many western militaries.